Everywhere I look, I see children with the latest gadgets and technology. There are television series especially for young children to help them learn. There are apps, websites and games to keep them entertained and assist with their development. Occasionally, my girls watch the TV or a film. Libby enjoys nursery rhymes on YouTube and Lia likes to watch as well. They both dance and sing along. Libby knows all the words and Lia joins in with some of the actions. And yet, I can’t help but feel that they learn more from actually doing things the old way, tech free. There have been a few great examples recently. 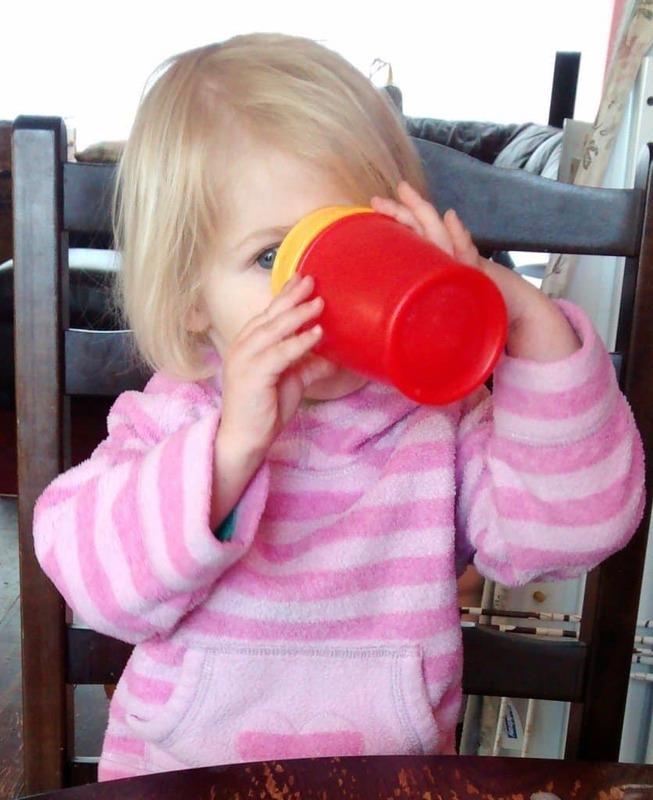 Lia was sent a toddler cup to review. She hasn’t got to grips with it yet because she doesn’t know how to sip. But it has taught her how to hold and tip a cup up. And Libby has taken to drinking from it so that if Lia gets hold of her drink, she won’t spill it everywhere. 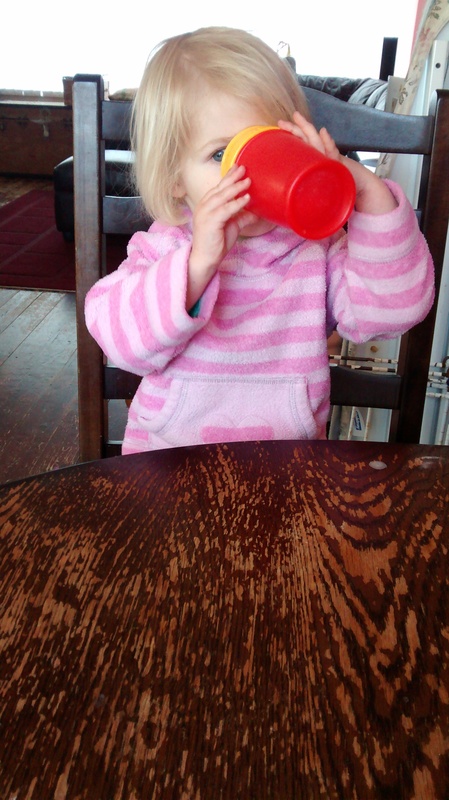 Would Lia have learnt to tip the cup up, and would they have learnt to share like this from an iPad app? I don’t think so. For Lia’s birthday, she was lucky enough to be given a lovely wooden shape sorter. It is also pull along toy. Just the sort of thing that Libby loves. Again, they learnt from this that it’s better to share and play together. Libby was allowed to play with it as long as she didn’t take it away from Lia. Lia copied Libby in pulling it along the ground and, more importantly, in putting the shapes in. She wasn’t getting it right, but she has got the idea both of sorting shapes and of learning from her big sister. Despite all this time playing with Lia’s toys, Libby is also doing some learning of her own. For months now, she has been wanting to write and learning to do the letters in her name. It is difficult to get her to recognise letters outside of her name, and she struggles a little bit with doing the letter Y in Libby. I have tried putting letters on a DVD for her and she has got quite into the alphabet song on YouTube. I do think it’s helpful, but it really doesn’t do anything for the formation of letters. So again, it was back to basics. She has been sent some little cards to write on, where she follows the shape of the letters in a picture. 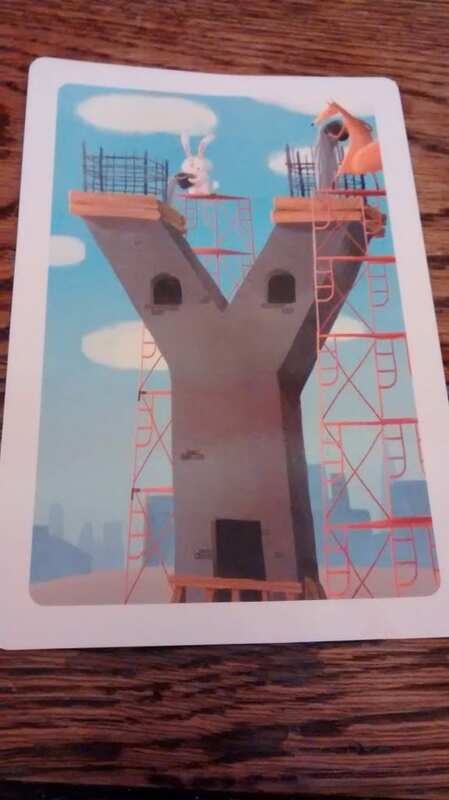 Here is the letter Y as an example. We are working with this at home, and she has been doing similar exercises on paper at nursery. Her writing is coming on in leaps and bounds. Don’t get me wrong, technology is really important in my life. After all, if it wasn’t for computers and WiFi, I wouldn’t be able to work from home and look after the girls. And yet I can’t help thinking that in some cases, we’ve just taken it a little bit too far. It might not be true for everyone, but my girls are certainly learning a lot from going back to basics. I agree! I have never had kids TV on in this house and I don’t think M is learning any less from not getting to watch, instead she is learning so much by doing things – like sipping from a cup or shape sorting or just exploring the world. I often am made to feel guilty for not letting her watch kids TV and I get so annoyed with it. I have watched some of the nonsense that is on there and she doesn’t miss out from not watching. She understand you swipe phones and press buttons to get them to work but cos she has watched me and if she finds a phone sitting she will press away at it but she has never been allowed to play on one or use t as anything other than a found object. Our family doesn’t watch mainstream TV after we made the decision when our 6th was a very young child, to turn the thing off. Within a week the children were playing more; using imagination, building, making, *doing* things. We’ve since had seven more children and none of them have been raised with the TV on in the background. They’ll watch films, DVDs, documentaries at times, but once it’s over the TV is off. We also threw out all our other TVs in the house so we only have one in the living room. Best decision ever. I couldn’t agree more. We have very little tv in this house. We do a lot of activities…yes its home school based but even then we theme activities that active often continued say on a weekend. The boys struggle though as it’s the one disagreement in our Co parenting; for them at their mums they have every gadget, every bit of tech and and app going. However, when you see the freedom of free learning and imagination then I know I’m doing the right thing! We’ve got these cards to review…I do think they’re very helpful and definitely makes it hands on rather than tech on. That’s really interesting about how differently you and your wife do things. It sounds to me like the boys probably have the perfect balance, I’m sure they will grow up to be all the more rounded for it.